Industrial production fell 0.7% in January 2016 which was slightly better than the (revised) -1.9% estimated for December. 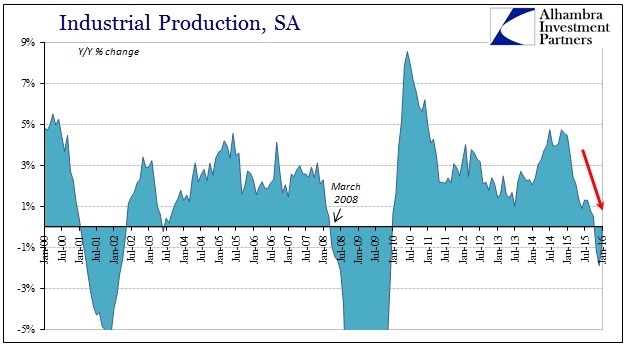 It was, however, the third consecutive month showing a decline and, more importantly, the 6-month average turned negative for the first time in the “cycle.” Industrial production, at least as far as the Federal Reserve’s estimated series for it, is actually a lagging indication particularly in the average. 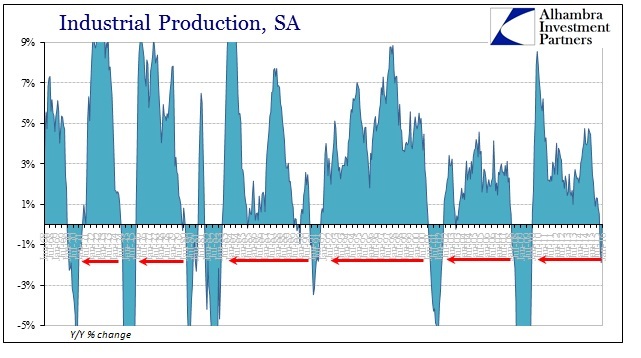 In other words, in every other cycle by the time the 6-month average falls below zero the recession is already several months old. The consistency with which we find that to be the case is very significant. In every recession since World War II, we find contracting IP shortly after each official cycle peak (declared by the NBER). 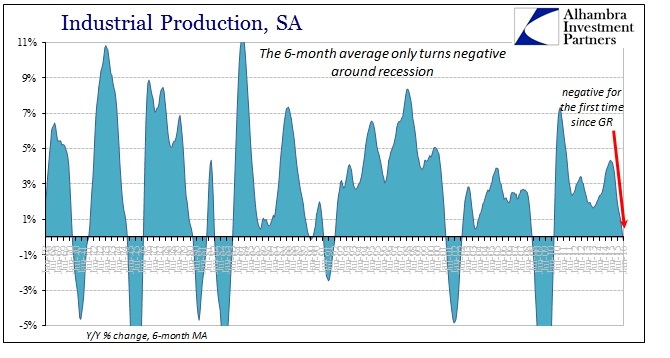 The one exception is the 1990-91 recession where industrial production briefly dropped to slightly negative several months prior to the start of that recession, only to rebound somewhat into its early stages and before again falling further below zero in accordance with this overall long-term pattern. 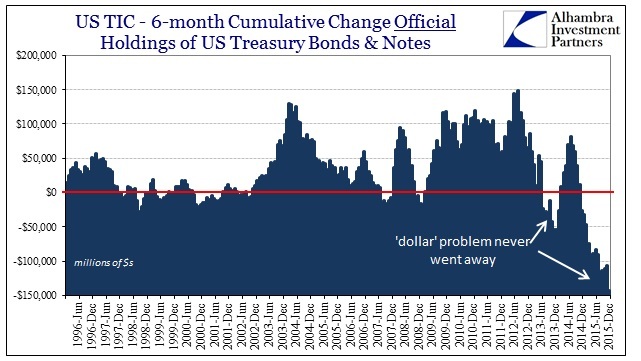 December was one of the worst months on record for foreign dealing with the “dollar.” The latest TIC update further confirms why January was under such persistent and heavy liquidation pressure in almost every corner. 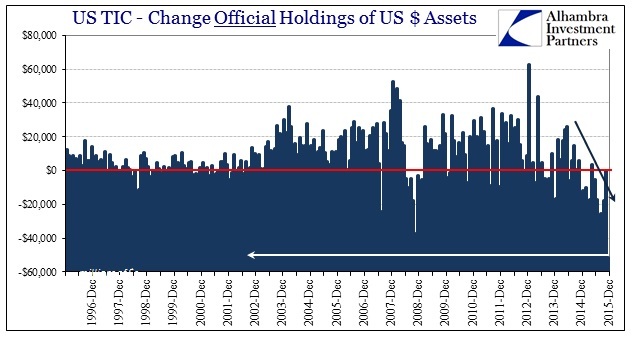 There was a record monthly amount of “selling UST’s” in foreign channels, a dearth of private “dollar” activity and, perhaps most important of all, bank liabilities for the last quarter of 2015 shrinking again at a troubling rate. Just starting with the monthly overall total, the funding disorder is plainly evident in comparison to some of the worst financial months. The huge “selling” pressure (and it should be pointed out again that “selling” UST’s and dollar-denominated assets in this context might be something other than liquidation; it could very well be an accounting transfer across jurisdictions, such as repo or derivative collateral flows, which leave market prices undisturbed but have enormous funding ramifications) was coming from the “official” sector, meaning foreign central banks and/or governments. As noted above, the one-month decline was by far the largest on record. With volume in Hong Kong heavy and losses severe in many places, there isn’t a lot to suggest a durable turnaround in stocks, banking or currencies. The mess of imbalance survives in Hong Kong, meaning that it will likely continue to afflict the mainland only further eroding sentiment all the way around. 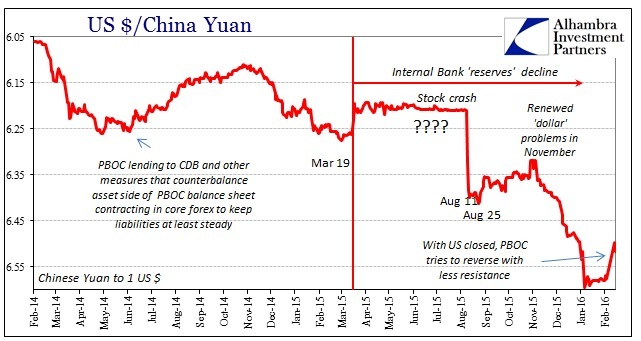 It will be interesting how the PBOC reacts, as surely they will and must. And they did, fixing the CNY all the way up to 6.50. It was unusually welcome news to a mainstream view that is more often predicated on “devaluation” as some sort of miracle solution. In other words, even the mainstream is starting to notice the correlation between the CNY’s regular and serious downdrafts and the liquidations that suddenly appear everywhere else in tandem. Even if you have no idea how or why that might be, just blind observation suggests the relationship. The problem of “how” becomes the issue going forward, and maybe even not too far into the future. While it was somewhat gutsy the size of the move on Monday, today open business across the eurodollar left the CNY fix already pushed lower to 6.518 (middle rate) with a selling rate as low as 6.531 (according China Merchant’s Bank). In short, the one-day window to rush to 6.50 seemingly worked in instilling enough confidence for a short-term rebound (perhaps just aiding the rebound that had started Friday), but already the conditions for its end are apparent across a wide selection of indications – starting with both China and the US internals (subscription required) beyond just the stubborn economic decay. As China, Japan is the definition of insanity. 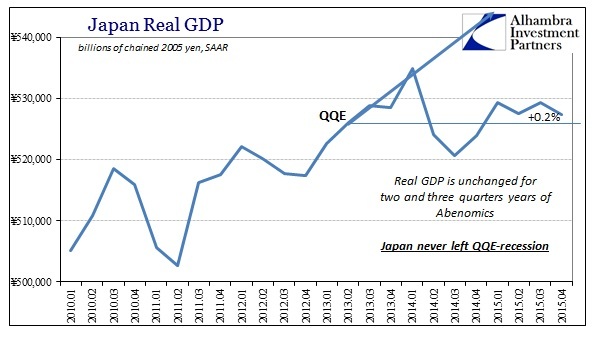 GDP fell 1.4% in Q4 2015, marking the fifth contraction out of the past nine quarters and yet the word “stimulus” remains attached to QQE, the Bank of Japan and Abenomics in general. At this point, how much more time and sample size is necessary before calling it a failure? In about six weeks, Kuroda’s massive “stimulus” will mark its third anniversary and the best that can be said of it is that GDP has gone nowhere. Two and three quarters years later, real GDP (SAAR) in the last three months of 2015 was the slightest bit higher than Q2 2013 when everyone was so sure “stimulus” was all so sure. The data suggest Japan’s economy is still plagued by the weakness of domestic demand as it enters a fourth year of record monetary stimulus, with wages not rising fast enough to persuade consumers to spend. There is no sign of a downward spiral in the economy but with the yen rising to trade at Y113.8 to the dollar in recent weeks, the figures put pressure on the Bank of Japan for even more monetary stimulus to encourage a strong round of wage rises this spring. The overall GDP figures are actually quite charitable to QQE, however, as the effects on the actual Japanese people have been devastating. This is not hyperbole. As noted last week under separate but confirming data, the Bank of Japan expanded total bank “reserves” by an overwhelming 339%, unprecedented in every modern fashion; yet Household Income fell by 7.1% in real terms. The GDP estimates for household spending show that, unsurprisingly, households have only cut back and quite seriously. Last month when China’s exports “only” declined by 1.7% (revised) the entire orthodox world took it as a definitive signal for the long-awaited monetary stimulus effects. Whether it was the yuan’s “devaluation” or the six rate cuts and the often double shots of reserve requirement reductions that accompanied them, December trade figures were so very encouraging. Economists, in particular, were quick to convince themselves of their faith in monetarism, as exports for January then were expected to “only” slide by 1.9%, similar to December, while imports were predicted to be almost flat – an unbelievable improvement given that imports had been contracting regularly by 15%-20% throughout most of 2015. As it turns out, these expectations for the turnaround were literally unbelievable since the latest trade figures from China were nowhere near them. Instead, both exports and imports collapsed yet again as if December’s monthly variation was only that. Exports dropped by 11.2% in January, the worst since March 2015 and the third worst of the “cycle.” Imports fell by 18.8%, more in line with last year’s baseline and nothing like a turnaround or even the hint of one. The slide in exports suggests the yuan’s depreciation since August has yet to result in a sustained boost to the competitiveness of China’s factories. While the decline in shipments to and from most major destinations raises concern of a lingering trade slowdown, the readings may also be influenced by the timing of China’s week-long Lunar New Year holiday and volatility in trade flows with Hong Kong. 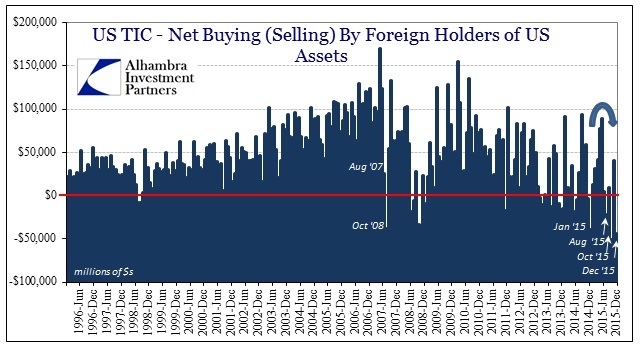 If we have at least a good idea about the gross exposure to US junk if not who ultimately holds and funds it, the emerging markets infiltration is much more difficult to parse. There are only a handful of estimates that appear reliable enough to obtain a decent range estimate. The first comes from the BIS and was written in 2013. At the time, the paper caused some stir as it announced what many had expected mostly about China – it had participated fully in the “dollar” short through several conduits, including the financial sector which was borrowing (through loans and bonds) offshore to fund client activities onshore (in dollars). Given the ongoing hysteria in Chinese markets vis-à-vis the “dollar”, I tend to believe their estimates were understated to considerable degree. Still, in terms of trying to find exposure among even the general “offshore” suppliers of “dollars” it is a helpful beginning. As a consequence, a significant share of Chinese corporate debt securities issued in OFCs [offshore financial centers], 16%, is denominated in renminbi. That said, the US dollar remains by far the most important currency of issuance for Chinese firms, accounting for 77% of corporate issuance in OFCs. Again, this could reflect differences in the cost of funding. Dollar-denominated rates are below comparable renminbi rates and many players expect an appreciation of the Chinese currency. The paper estimated that from July 2012 through June 2013 Chinese firms had issued a bit less than $50 billion in debt securities, gross, of which $20 billion was made up of those “other” firms including financials. About $4 billion of that was denominated in RMB, leaving the rest foreign and mostly US$. The January retail sales report demonstrates perfectly the nature of this whole recovery, but especially the last year or so when everything holding to the primary narrative boils down to the unemployment rate – a statistic that is more and more determined by peculiar assumptions and calculations. The advance release from the Census Bureau had enough positive vigor to provide palpable enthusiasm in place of the very reluctantly increasing glumness. Greater job security, improving wage growth and falling gasoline prices may be persuading more consumers to loosen their purse strings after a fourth-quarter slowdown. A pickup in household purchases, which account for the lion’s share of the economy, would help the U.S. stave off the negative effects of a strengthening dollar, sluggish foreign demand and tumultuous financial markets. When initially searching for how or where consumers were “spending freely”, I failed to see anything resembling strength or “greater job security, improving wage growth”, etc. 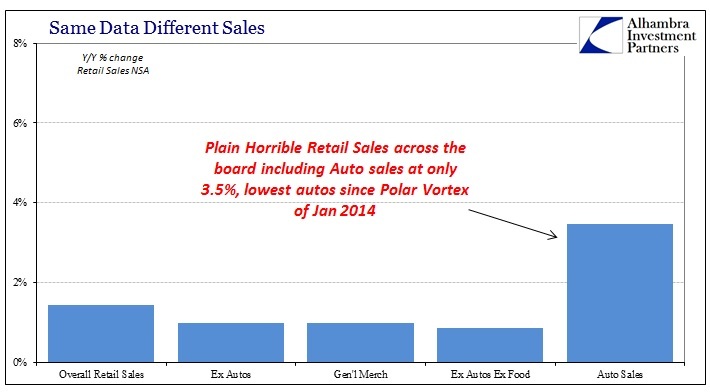 Instead, the retail sales report was the usual flavor of awful, with sales growth overall including autos just 1.44% in January. Strong consumers would be represented by at least 5% if not steadily above 6%. That rate was the same as the snowy cold of February 2015 and worse than the awful November that started the hugely concerning Christmas season. Auto sales themselves were up just 3.5%; a broad-based disappointment no different than the recessionary levels that have become alarmingly common since the end of 2014. With the release of retail sales, the estimates for inventory across the whole supply chain are completed for December. 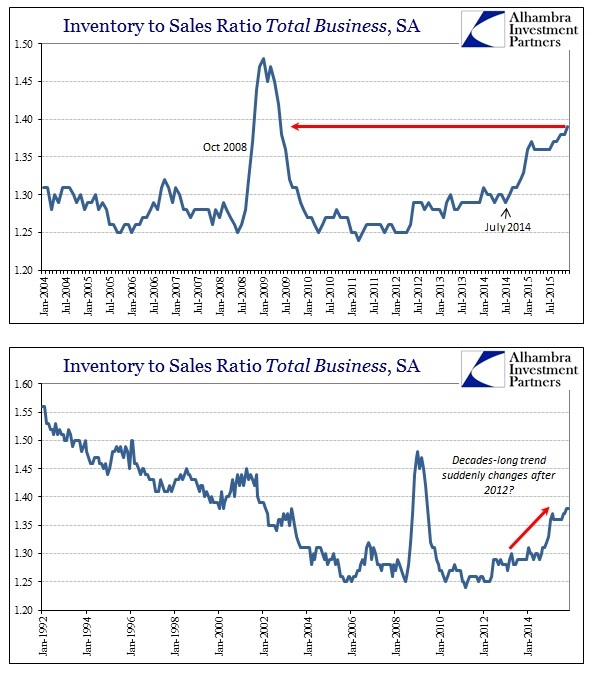 The inventory-to-sales ratio for total business rose yet again to 1.39; the last time the series was that out of balance was May 2009, a ratio higher than what was registered in October 2008. 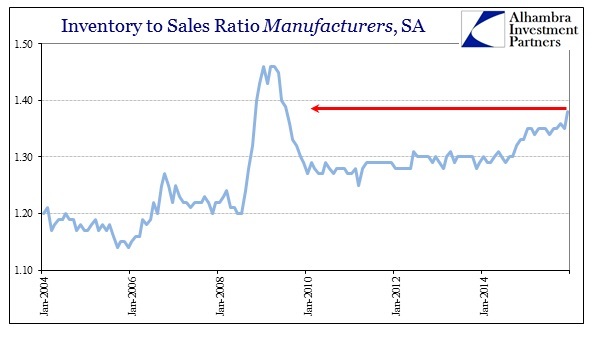 The ratio for the manufacturing level surged to 1.38 from 1.35 in November, as sales declined quite sharply (by almost $7 billion SA). The inventory imbalance in retail was also the highest since May 2009. If jobs are truly the measure of economic growth through consumerism, they are truly absent here. 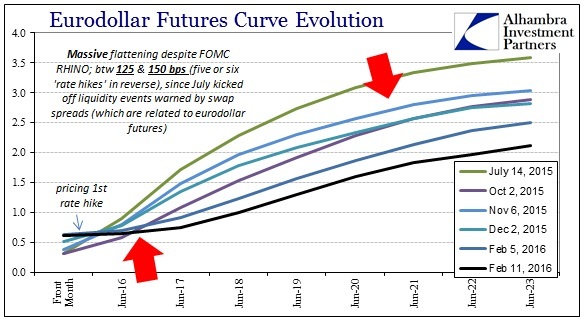 I use the June 2018 eurodollar futures contract as a significant benchmark in my analysis of money markets because I feel it represents a solid cross section of sometimes conflicting influences. It’s close enough to the front end as to be significant both in terms of monetary policy as a factor but far enough to be as heavily if not more representative of intermediate economic expectations. And on that account, there is still enough volume and open interest where the depth of liquidity cannot be questioned. As of yesterday, the CME reports open interest of 416,955 contracts each for delivery of $1mm, meaning $417 billion or so in gross contracts written. Thus, to see it move so far so fast being bid is simply astounding. This morning, the June 2018 was as a high as 99.165! In closing price alone, currently at a still impressive 99.01, that’s 30 bps just this week. And that follows a mind-boggling collapse (for Yellen’s dreams) 103 bps in 2016 alone. 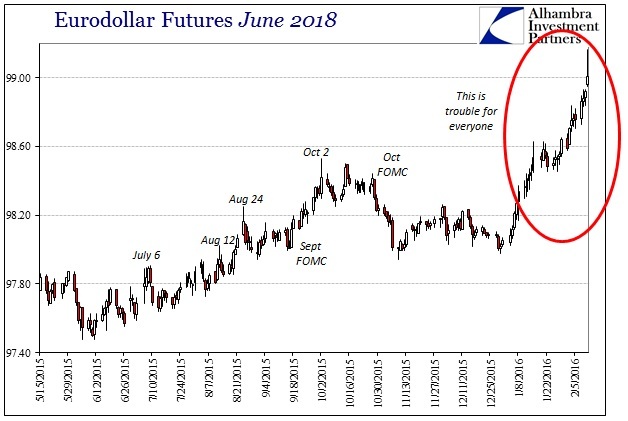 Yellen ordered a quarter-point hike in federal funds and received instead four of them in reverse across the much more significant and important eurodollar complex. We must be mindful, too, that China is closed all during this week, surrendering an easy and overseas story for causation. I don’t think China is out of the equation entirely, especially via Japan, rather it seems though the current flurry of bearishness is eurodollar all its own. 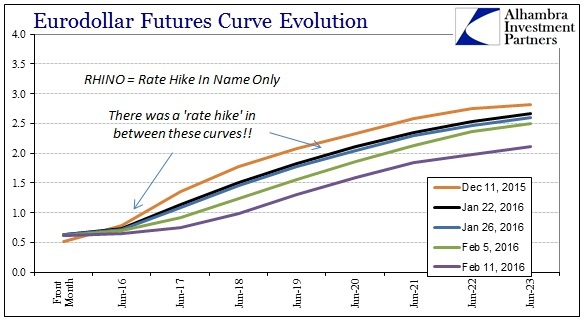 The curve collapse is similarly beyond easy description. The front month WTI futures contract traded as low as $27.27 this morning, a few dimes less than the low of January 20. Just three months out, however, the June 2016 contract is trading at $33.17 and up $0.43 on the day (as of this writing). Just two months further to August, that futures price is $35.11, up $0.53 on the day. That’s about $8 contango just in the five months. This sharp “hook” downward in the oil curve is the signal of liquidation, and unorderly at that. Trading earlier this week certainly reflected that up and down asset markets, as liquidity strains were evident in widespread fashion. 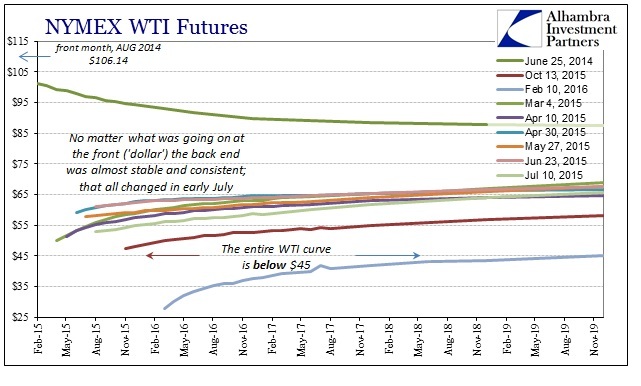 The effect in oil has been devastating, however, as those optimists still suggesting this is all about “supply” are finding the liquidations “winning” the curve battle. In other words, basic economics suggests that demand should rise at lower prices, even with the “friction” of supply, but the persisting liquidations and the cumulative effect has only been lower and lower. The oil curve, like money curves everywhere, is prisoner of a dark economic future. Everyone knows the Titanic sank in April 1912, and if they didn’t they were reminded only a few years ago at its centennial. Less well known, for good reason, is the novelFutility, written by Morgan Robertson in 1898 years before Titanic had even been conceived. Robertson’s book includes the largest vessel ever constructed and he even offered it the name “Titan.” And much like the real Titanic, Titan carries only about half the lifeboats necessary for all the souls onboard and even strikes an iceberg in the Atlantic closing in on Newfoundland. The physical descriptions of the ship in the novel were eerily close to what Titanic would eventually become; including a capacity for 3,000 passengers and crew, the configuration of the masts and even the propellers. To some, Robertson was a visionary if not a prophet. The legend survives to this day because of those similarities. It is not well-known beyond the committed because the similarities end there. And even the seeming connections are not all that fantastic to begin with; in 1898 large ships were attaining that configuration and size, Robertson merely imagined what the next steps might be. Further, the route through the North Atlantic was just common and icebergs a quite familiar hazard especially at night (both Titan and Titanic met their fate around midnight). When real household spending fell by 4.6% in April 2014 it was cause for concern. That was the first month after the tax hike hit and the decline in spending was much larger than anticipated (by economists, at least). Despite the heavy toll, Bank of Japan officials remained (outwardly) wholly unconcerned over what was believed a minor setback on the road to raging inflationary success. With so much “stimulus”, including of the fiscal kind, there was no way Japan’s economy would fail to respond. While spending had declined, “inflation” had ticked to its highest level since February 1991. Japanese consumer prices showed that inflation picked up in April , excluding the sales tax increase that started at the beginning of the month, government data showed Friday. The data was a welcome sign in the central bank’s battle to increase inflation to 2 percent. Economists were overjoyed if somewhat cautious. “Consumer spending has declined as expected in April, but this is likely to be minor blip and will not affect the ongoing recovery,” Martin Schulz, of Fujitsu Research Institute told the BBC. By August 2014, Bank of Japan Governor Haruhiko Kuroda was quite confident and positive despite weakness in spending that persisted well beyond April 2014 (May was actually much worse). In April last year , the Bank of Japan introduced quantitative and qualitative monetary easing (QQE) to achieve the price stability target of 2 percent at the earliest possible time, with a time horizon of about two years. The last time I addressed you here was only a year ago. At that time, I mentioned that there was a positive turnaround in three areas since the introduction of QQE: in financial conditions, expectations, and economic activity and prices. Since then, QQE has been steadily having its intended effects, and the positive turnaround in the three areas has continued. 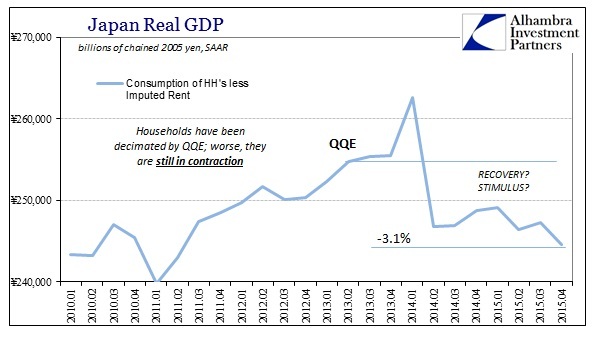 Japan’s economy has been on a path suggesting that the 2 percent price stability target will be achieved as expected.